Nintendo has dominated the hand-held game market since hand-held gaming became a thing. The company’s sold hundreds of millions of editions of its GameBoy, GameBoy Color, DS, 3DS, and 2DS handhelds, and it’s not surprising that Nintendo would feel the pinch of the smartphone revolution a bit harder than Sony or Microsoft. However, the company has decided to adapt with the times and allow some of its most popular franchises to journey onto smartphone games. For example, Pokemon has made Nintendo billions of dollars, and people are nuts for the little Japanese monsters. Unsurprisingly, people want another way to play Pokemon on the go, and Nintendo’s recent E3 announcement will shed a little light on how that will work. Pokemon fun will soon be found on your smartphone in the form of the freemium game Pokemon Go. The game will be developed by Ninantic, who made the augmented reality game Ingress, for Nintendo and The Pokemon Company. Indeed, Pokemon Go seems to center on walking around and finding Pokemon, so it seems like a pretty natural progression. 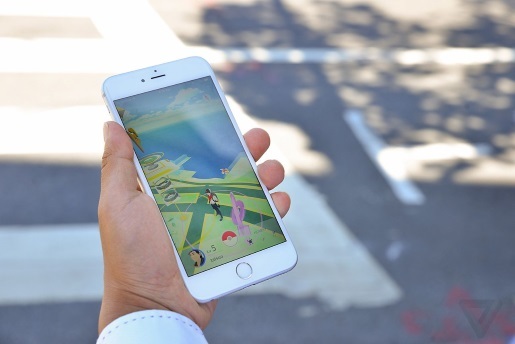 Players use their smartphone camera to look through a digital environment to catch all those pocket monsters. Gyms are controlled by one of three teams (Red, Blue, and Yellow) and players can team-up with their fellow counterparts to make capturing gyms easier.